Thank God for the firm actions the U.S. has taken with Iran. Pray for political and religious freedom for the people of Iran and for the U.S. to pursue wise and effective policies in dealing with Iran. VIDEO: In May, a small group of IFA intercessors joined IFA staff for the National Day of Prayer and a celebration event at the Embassy of Israel in Washington, DC. We were very impressed with Ambassador Ron Dermer’s succinct explanation of what was wrong with the Iran Nuclear Deal. Click HERE to watch him explain. 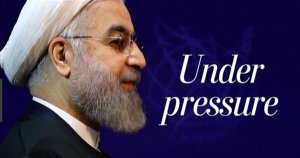 President Trump made clear when he ended United States participation in the JCPOA (Iran Nuclear Deal) that his Administration would be reimposing tough sanctions on the Iranian regime. Iranian Christians Testify About Being Imprisoned for Christ: Two Iranian Christians are pleading with the world to hear the cries of the Iranian people as they recounted their own ordeal of being imprisoned for their faith. In remarks before hundreds gathered at a plenary session at the State Department for the Ministerial to Advance Religious Freedom, Maryam Rostampour and Marziyeh Amirizadeh explained how Jesus Christ sustained them and miraculously intervened when they were jailed. The women were born into Muslim families who became Christians as young adults; the two friends met in Turkey while studying theology in 2005. The two women were arrested in 2009 by the Iranian regime because of their Christian faith and spent 259 days in one of the nation’s most notorious prisons. They were subjected to daily interrogations and mental torture, were said to have committed various offenses — apostasy, blasphemy, promoting Christianity in Iran — and were sentenced to execution by hanging. During their ordeal, Iranian officials also routinely threatened their lives and the lives of their families in order to pressure them to recant their faith, but they refused. “Since Islam is the only official religion in Iran, government authorities forbid other religious minorities from practicing their faith,” Amirizadeh said, noting that persecution against Christians has been rising in recent years. Men and women who leave Islam for the Christian faith are deemed “infidels” and “dirty,” she continued, and such individuals often face the death penalty and various kinds of torture…. “Hundreds of Christians have been arrested by Iranian authorities and charged with disrupting national security for being a Christian and participating in home churches, receiving prison sentences of 2 to 10 years,” Rostampour explained Wednesday. Despite these pressures, Christianity is spreading in Iran, she continued, and the majority of Iranians are tired of their current government as they regard it as corrupt and oppressive. Lord, I pray for the church in Iran, that you will give your followers in that country supernatural strength and courage as they await your answer to their prayers. I pray that the people of Iran would feel the support and of the American people and the Trump administration. Thank you for courageous leaders, such as Donald Trump, Mike Pompeo, Netanyahu and many others who are willing to do what is right in spite of enormous political pressure. I pray for peace for Israel, peace for Iran, and peace for all in the Middle East. Father may your will be done on earth as it is in heaven. Thank you Father that President Trump has withdrawn from the Iran deal made by Obama. Father God l pray that You will put an end to Iran’s nuclear program and that they will NEVER be able to produce nuclear weapons. Bless Christians in Iran and deliver them from persecution please Lord.